Will it stay in stock? Google's Nexus 4 has been one hot commodity, having just crossed the million units shipped mark late last week, in spite of constant sell outs. Since launching in November, it's been almost impossible to get a hold of the Nexus 4 without monitoring the Google Play store daily to see when the stock has been replenished. For those consumers that have managed to get their hands on the elusive smartphone, there's now a new reason to return once more to the Google Play store. 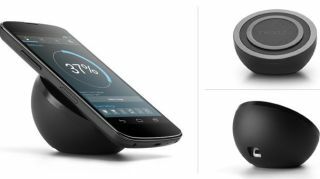 On Monday, Google finally opened sales for the Nexus 4 wireless charging dock, which had been promised when the phone was first revealed. The geode-looking wireless charging station is currently available for US$59.99 for North American customers, and provides power through a Qi inductive charger. Expected to ship in the next week or so, the docking station is shaped to provide a better viewing angle while the Nexus 4 is charging. Curiously enough, you can see a new charging menu on the display of the Nexus 4 in the promotional image seen above. There's no indicator on the storefront that the station will cause your phone to feature a new look while charging, but the smooth interface definitely follows the unique look and feel of the dock. Like the Nexus 4 itself, there's no telling just how long the wireless charging station will be able to stay in stock, so if you're in the market for a new charging accessory, it's probably best to act fast. There's no sign yet of international availability, but we'll keep an eye out.